UPDATE 08/2011: This service is not longer free. It’s $10 to create your font. Still, not bad if you are a font nerd like me. So, I’m a procrastinator. I’d like to say I’m a recovering procrastinator, but I’m not there yet. The down side to putting all my tasks off until the last minute are the periodic moments of panic scattered throughout a typical week. No middle ground for me! It’s either a sense of calm and well-being as I ignore the work piling up. Or, it’s the terror that strikes hours before the deadline. In the past, I tried to reform myself. Now, I just blame the problem on genetics and my childhood. It’s easier that way. The upside to my procrastinating ways is all the cool stuff I find on the internet while I’m distracting myself from my to-do list. Take this website for example: www.fontcapture.com. It’s a fun and easy tool to convert your own handwriting into a true type font that you can use on your computer like any other font — even in design programs like InDesign, Photoshop, and Illustrator. Best part? It’s free. It’s now $10. Still a pretty good deal. Go to the website and download the template. Print the template and fill it in (like I did above) with your handwriting sample. Scan the completed template and upload it to the site. Name your new font and download it. 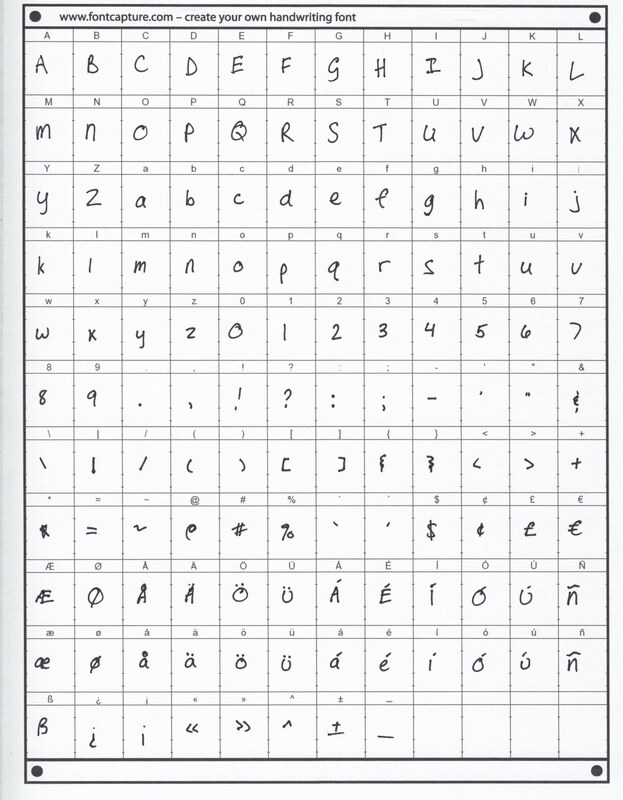 Once you have it on your computer’s harddrive, you can install it like any font. Possible uses? Create a new font for a design layout. Print nearly hand-written looking letters to friends and family. Fill out forms. “Sign” documents. Fool the teacher into thinking your mother wrote a doctor’s note.Whatever. This entry was posted in media. Tagged communication, GoWild, tools & tips.